After years of feeling like I wasn't even making a dent in my holiday patterned paper pile, this year I actually finished up a couple of packages that had just a few sheets, bits and pieces etc left in in them. 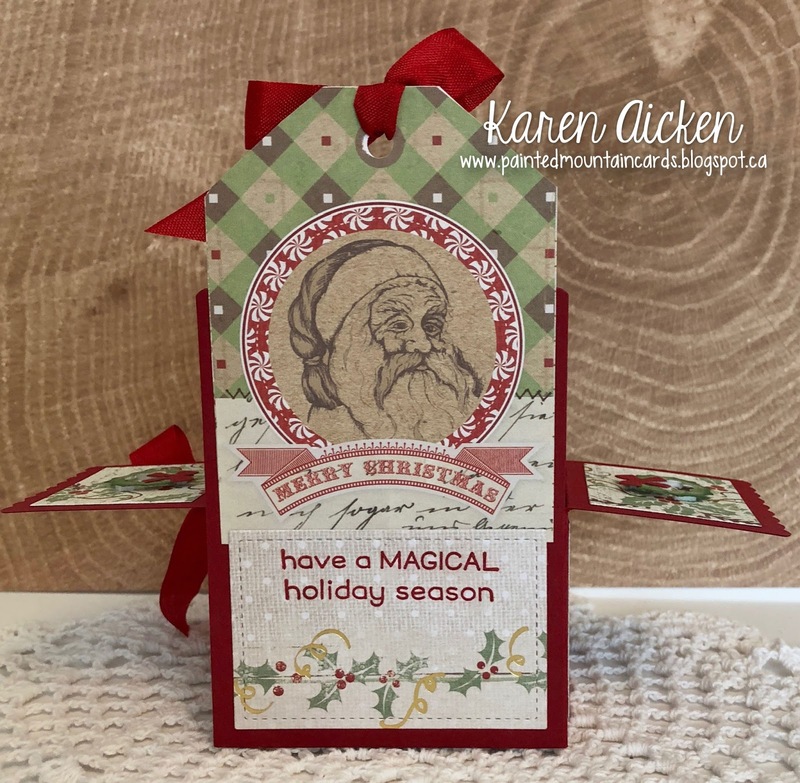 This card was made with the last little bit of patterned paper from a package, and a few printed embellishments from the same package that were also remaining. 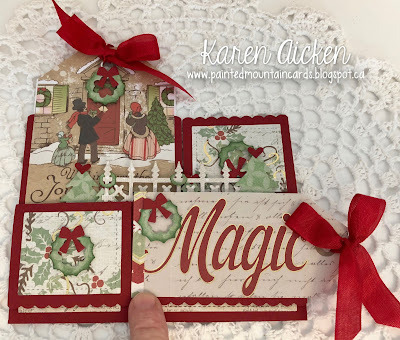 I love the look of this vintage paper, and especially all the red glitter! For the front I paired the paper and embellishments (fishtail banner and tree circle) with half of a gold foil snowflake. This Christmas Tree Pop-Up by Karen Burniston is really something. For this one I put it towards the back of the card which gave me lots of room at the front edge for the stamped greeting. After die cutting the tree pieces, I used the embossed feature of the dies and an embossing sandwich to create the raised dots - then I swiped them with a watermark ink pad. Then I added Glitter Dots and gold glitter glue randomly on the raised dots. 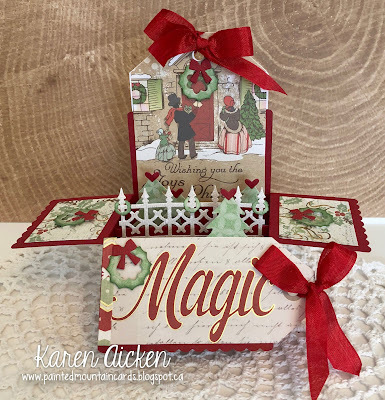 The red beaded borders are decorator dies that come with the new Tag Book Pop-Up. They match the one from the Snowman Twist Circle Pop-Up, which is what I used on the stamped circle. 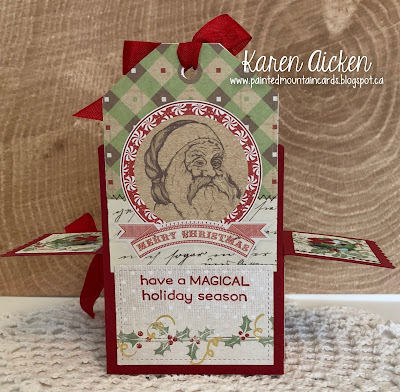 The little tree stamp is by Wild Whisper, and I scattered the image around the card using watermark ink. It's amazing that this dimensional card folds completely flat for mailing! Card size 5 x 6"
WHEW. I'm running behind this year, but I now have SEVENTY FIVE Christmas cards all addressed and ready to take to the post office today. It took me all day yesterday to address the envelopes, print the Christmas letters, and get those envelopes stuffed. Usually I start well ahead of this date and work on them a few at a time but this year I just didn't have a chance. I still have a few more to do, names that will pop-up or unexpected guests ... but I have extra cards ready for that. I will be doing a happy dance when I leave the post office later today. I also gave my mom her FOURTY Christmas Cards this past weekend, so she will be getting hers out as well. She likes to send out my hand made cards, so I always make sure she has enough. For my share today, I have a pair of Gift Card Holders. Once I saw this YouTube video by Dawn's Stamping Thoughts with instructions, I couldn't wait to try it out! Here are my first two. I really like how these go together and have to admit I have made several more, some of which have been shared already. I rarely post my projects in the same order I make them. I chose not to add quite so many matted layers on my Gift Card Holders, and found they are bulky enough I'm glad I didn't. 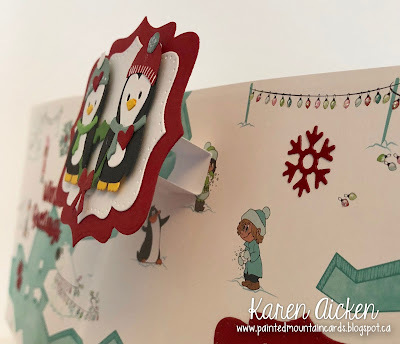 For these ones I chose this bright patterned paper by Stampin' Up that I've been working with for so may of my holiday cards this year. After making these, I'm down to just pieces and no more full sheets. The first Gift Card Holder will be perfect for any of the men in our family this year. Inside you can see the pocket on the right that the gift card fits in perfectly. 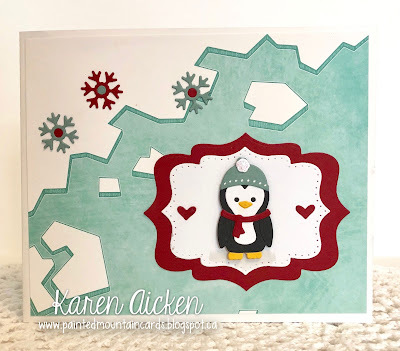 The red zig zag circle was sitting on my stamping table - it's the inside of the beaded frame that comes with Karen Burniston's Snowman Twist Circle Pop-Up card. Love it when nothing gets wasted. The second Gift Card Holder uses some older stamps, and I enjoyed getting them out to play with again. There is lots of glitter on this one! The finished size of these Gift Card Holders is 4 x 5-1/2". So they easily fit in an A2 envelope but I will probably be packaging mine in either a clear bag envelope or in a cello bag with some sweets to go with the gift card. 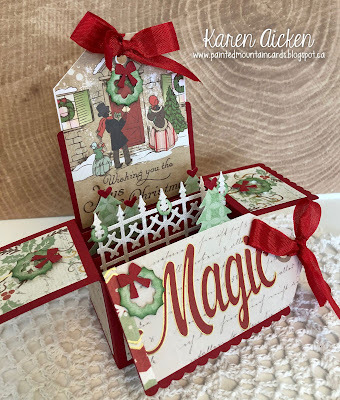 I'm back today with another box card using the sweet scalloped box card die by Lawn Fawn. I added the fence from the House & Fence Pop-Up by Karen Burniston, as well as a couple of trees from the Winter Charms set. The tiny hearts are from the new Cat and Dog die set, and the wreath is from the Sleigh Pop-Up set. This patterned paper stack had several sheets of printed tags in it. I have been using them for a couple of Christmases now and honestly, I'm done working with them. If I can figure out a way to use the full sheets as a card I will. Otherwise those sheets will head to the recycle bin. I did use several of them for this card though and they sure made it speedy to decorate! This card folds flat for mailing! I always have fun with the Katherine Label Pop-Up, creating different shaped windows and adding different materials over the windows. This time I added a doily inside and I like how it shows through to the outside, giving just a peek at the decorated label inside. To cut the red frame I traced around the outer edge of the largest Katherine Label then fussy cut it. Then I added a few more dies that come with the Katherine Label Pop-Up. When the card is opened, the decorated label pops up and out. There are some matted labels on the inside right, below the Farmer Riley's as a place for a signature and short note. I'm still figuring out how I want to colour Riley - these ones were done with Copic markers. I made them dark, as the moose I saw driving home recently was VERY dark. But I think I might like the Riley Moose's lighter. Now I know! I'm back today with a pair of Gift Card holders. I first saw them HERE on Dawn's Stamping Thoughts YouTube channel and have been making all kinds of them! These were done at different times, but am posting them together. They aren't meant to coordinate, lol - in case you thought I may have lost my marbles. Oh. My. Goodness. The little penguin from Karen Burniston's Winter Animals is just adorable. Here he is wearing a winter hat and scarf - both come in the same die set. The patterned paper is embossed and sparkly - perfect for the holidays. My goal this year was to use some of my older products along with new ones so I pulled out an older stamp set for the words on this one. The penguin is sitting on a snowbank created with the Nature Edges set. The penguin body is cut from charcoal Stardream, which is a pearlized card stock. I love using it instead of black as it catches the light and gives the die cut some 'life'. Inside I added another stamped greeting, a place to sign our name and a little die cut wreath from the Sleigh Pop-Up set. I actually cut and assembled 10 of these wreaths to have on hand for adding that little somethin' somethin' to projects this year. See how perfectly a gift card fits in the pocket? ... and it's also embossed and sparkly. I added printed embellishments and a handwritten banner to the front. I was sure I had this stamp but couldn't find it anywhere so ended up just writing it out. Some more gift card sayings and printed elements are inside. I like to have a supply of nice Gift Card Holders on hand for the holiday season, so these will be added to the stash. It's Saturday and that means a new challenge at the Crazy 4 Challenges Blog. I am the hostess this month, with my Design Team Sister Kelly Booth as our Guest Designer. Kelly's blog can be found HERE. 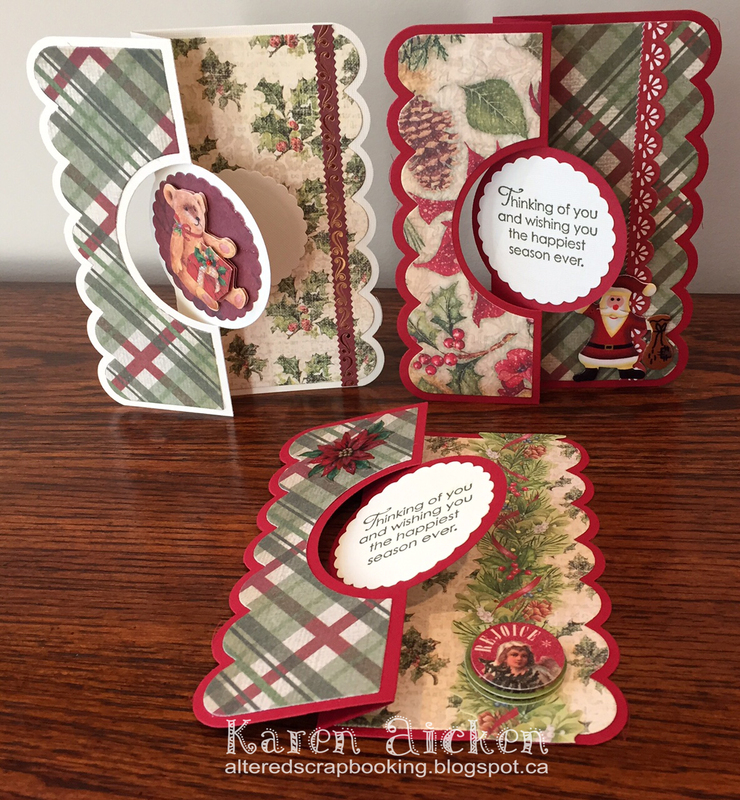 Here is my final challenge for the month: “Christmas or Winter Card” - It’s only 1 month until Christmas, so make a Christmas or Winter themed card today to get a jump on your stash. I love that the patterned paper has shiny, sparkly bits. Inside I used the Cupcake Pop-Up, hiding the cupcake shape with a matted oval. Riley the Moose and Percy the Penguin are waving hello. Such a cute pair, don't you think? 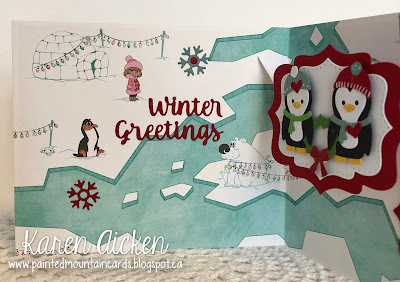 I used the Nature Edges to cut the snowy hill at the bottom, and combined words from the new Word Set 4 - Just a Note, with Word Set 3 - Holiday for my greeting. All of Karen Burniston's Word Sets work together for lots of different combinations! Check out the C4C blog to see how the Crazies have been inspired by the challenge. We'd love to see your take on it, so be sure to stop by the Crazy 4 Challenges blog and link up your creations. If you are uploading to an online gallery, please use the keyword C4C 413. Card size - 5 x 5"
I have a trio of Flip-It cards to share today for Flip-It Friday here on my blog. These photos have been hanging around, but this year I vow to get them posted. Sorry about the old blog watermark! All of the cards have the same stamped holiday greeting, and papers & stickers from my stash. Oh how I love Karen Burniston's cutie patootie little animals. I'm not alone either, they are VERY popular on the website! This Penguin is from the Winter Animal Set and here he is all decked out for winter with a scarf and toque. 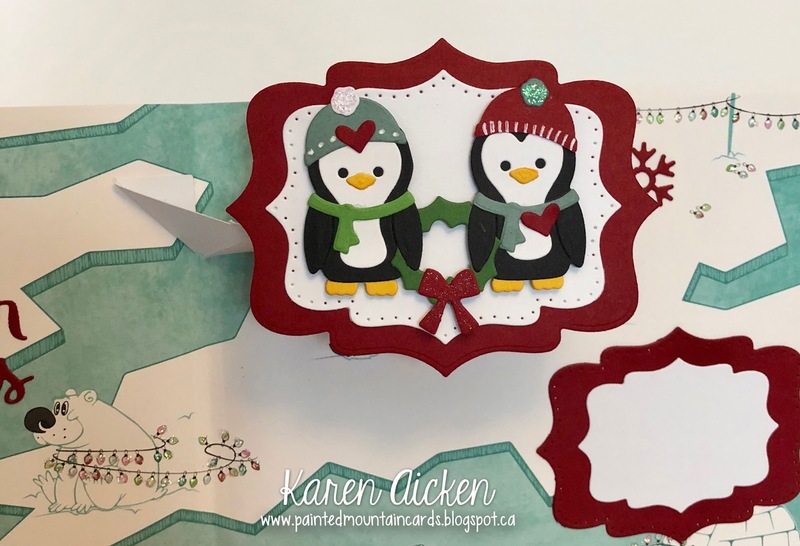 I used a number of Karen Burniston dies for this card - the labels are from the Katherine Label Pop-Up, the tiny hearts are from the new Cat and Dog Animals, and the snowflakes are from the Sleigh Pop-Up. I have to say how much I'm liking red snowflakes - wish I had used more of them on my holiday cards this year. The patterned paper is by Moda Scrap at Elizabeth Craft Designs. It's lovely stuff, made in Italy. 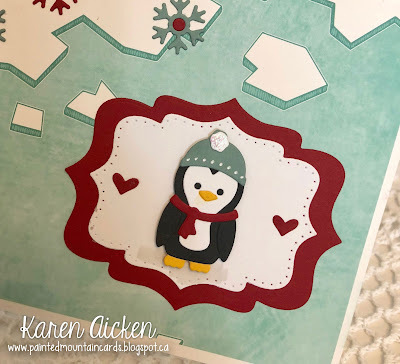 I purchased this package simply because I knew how well it would work with this penguin die and I was right! Inside I used the Katherine Label Pop-Up to animate a pair of penguins holding a wreath between them. 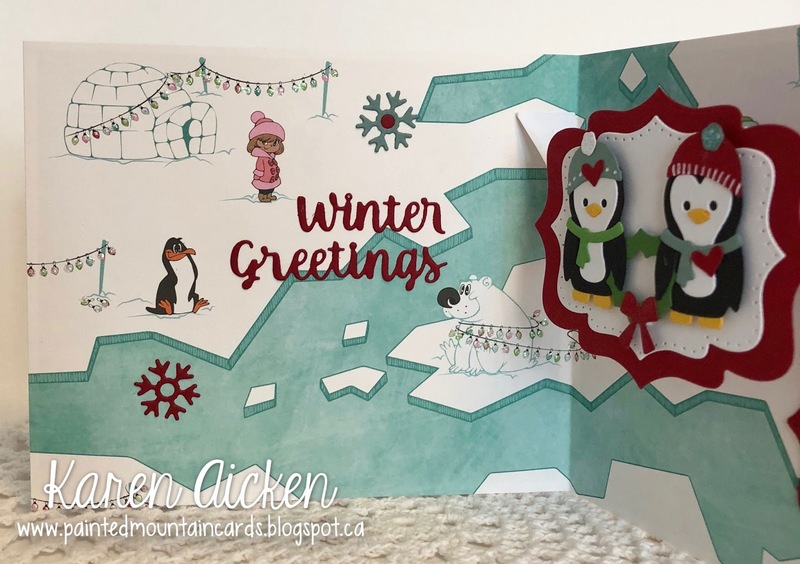 I love that you can combine the different words in the Word Set 3 to suit you - here I chose the 'Winter' and the 'Greetings'. It works perfectly for my theme here. The Katherine Label Pop-Up die set comes with an arm that you cut and fold (score lines are right on the die, so it's easy peasy to do). Then you can adhere whatever fits in your card, onto that arm. It raises and pops up as the card is opened. I love this die set! At last count, I have used it for fifteen cards!! And I have used the labels a lot more than that. 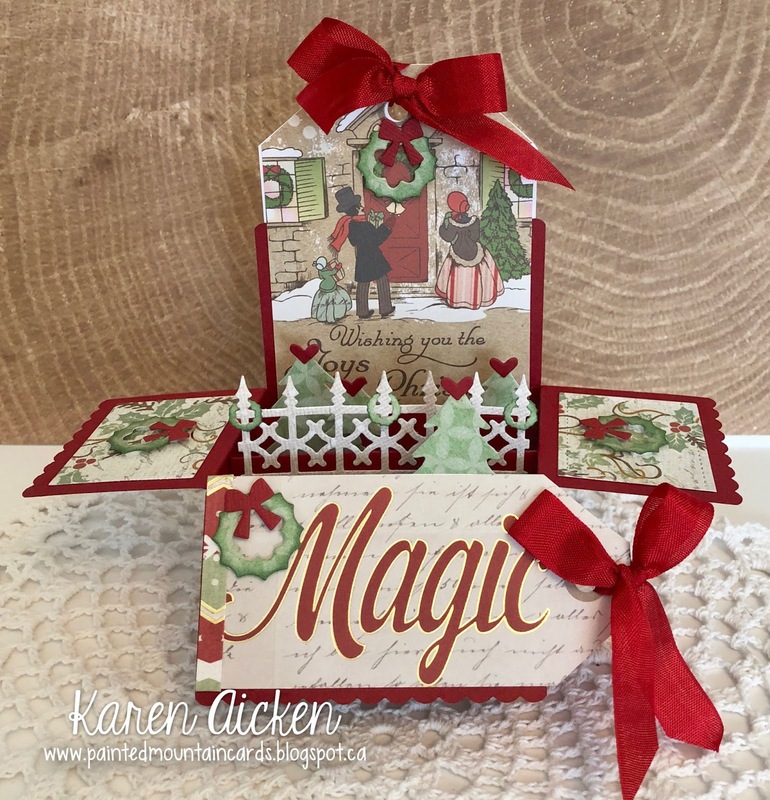 I have a fun card to share today using a bunch of Karen Burniston dies, a new Prickley Pear stamp and the Scalloped Box Card by Lawn Fawn. I chose the Gnome Home stamp set because I thought the mushroom homes would make cute houses for Karen Burniston's various cutie patootie animals. Here I used the Hedgehog from the Winter Animals set. I have a goal with these box cards, and that is to make them simpler. I have made several and they can take quite a long time to put together. Once I have put that kind of effort into a card, I only want to send it to someone who would appreciate it. However, they can be really cute without being stuffed full and they take a fraction of the time to create. Box Cards make an impression, and there is lots of room to embellish as much - or as little - as you want. I'm hoping to use my Box Card dies more now that I have wrapped my head around keeping them being simpler to create. I added two sections (or shelves) to the inside, cut 4 strips of grass to fit, added the heart-holding-hedgehog, a stamped and coloured mushroom and the tree from the Tree Pop-Up. The card was finished in record time, too. The back side has a stitched rectangle for a handwritten message. I love how they fold completely flat for mailing! 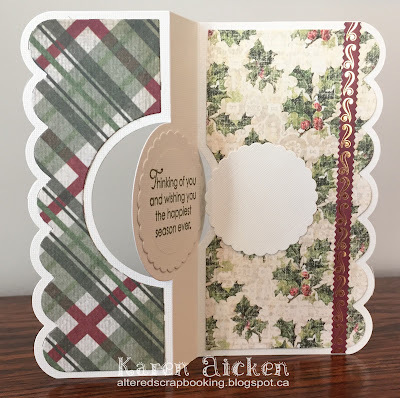 While the Lawn Fawn Scalloped Box Card was made to fit into an A2 envelope, on my card the tree stands above the scalloped edge of the card back. It will easily fit into a 5 x 7 envelope though and mail for a single stamp.